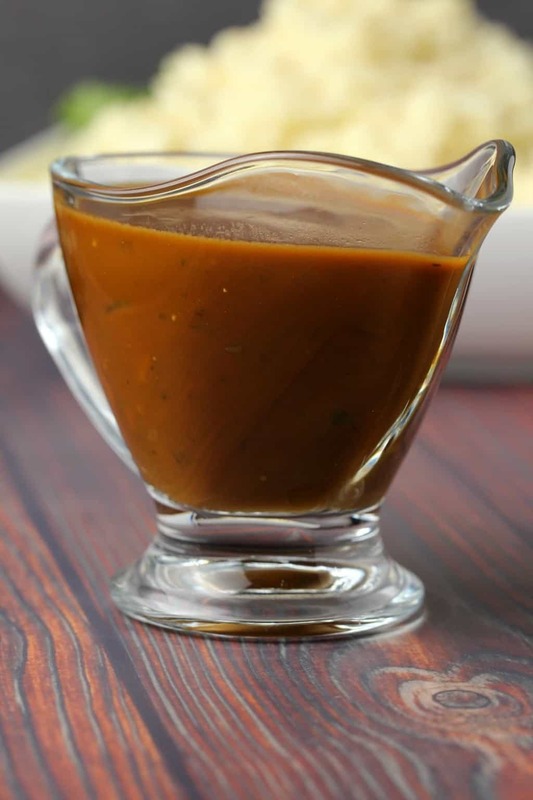 Vegan Gravy, Rich and Flavorful! 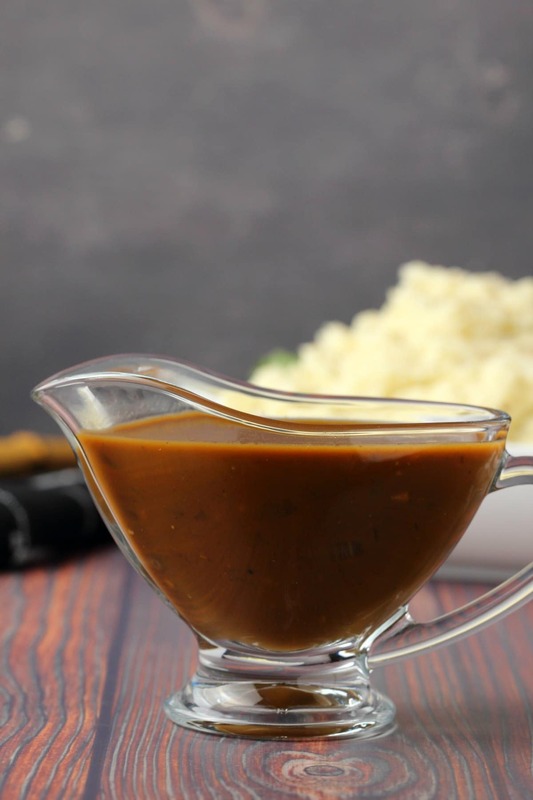 This vegan gravy has been making us very happy! 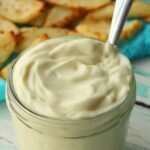 It’s super easy to make and absolutely divine poured on top of some vegan mashed potatoes! Add some vegan sausages and you have bangers and mash. Sooo good! 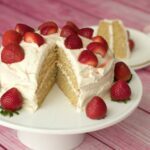 It’s a simple 9 ingredient recipe that is ready in 30 minutes. It’s so tasty that you are going to want to pour it on everything once you’ve tasted it. You start off by frying some onions and garlic in some vegan butter. Then you mix up some flour with a little coconut milk into a paste, then add some more coconut milk and then pour that into the pot along with some vegetable stock and soy sauce. Keep whisking until it boils and then keep boiling and stirring until it thickens. Add salt and pepper to taste and you’re done! 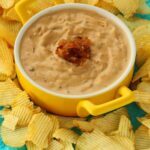 It’s wonderfully rich and creamy and tastes just like gravy should! It has some lovely texture from the onions and it’s hearty and really satisfying. If you’r a fan of mushrooms though, then you should definitely try our vegan mushroom gravy. It’s every bit as good as this gravy, just with mushrooms! Do I have to use coconut milk? No, not if you hate coconut or are allergic. 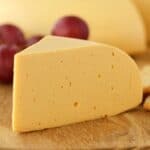 You could substitute for a different non-dairy milk like soy. 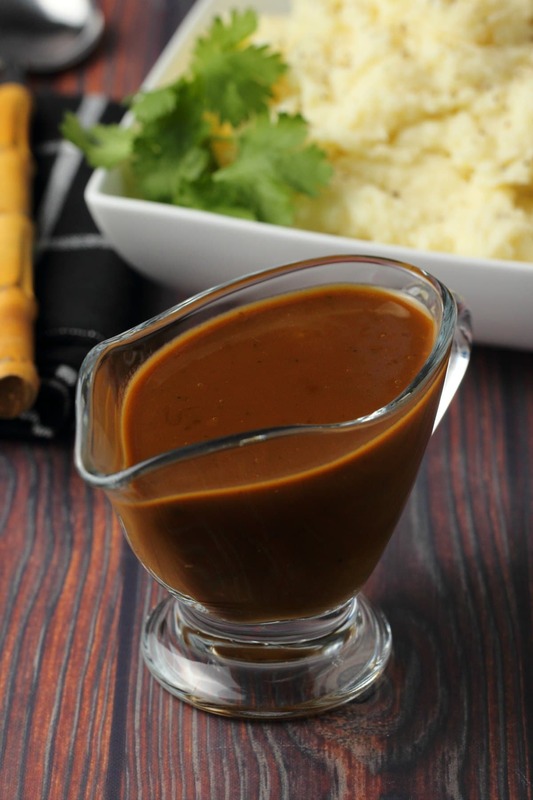 We like this gravy with coconut milk as it’s deliciously rich which is what we were going for, but a different non-dairy milk can also work fine here. Can I make it gluten-free? 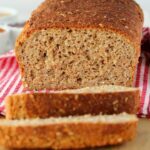 You can, you would just need to use a gluten-free all purpose flour blend to replace the regular flour and a gluten-free soy sauce. Why dark soy sauce? Dark soy sauce gives it the really rich color here. You can use a light soy sauce if that’s what you have on hand, but the color will be much lighter as a result. 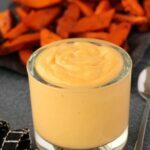 I hope you’ll give this vegan gravy a try! Enjoy it hot! Leftovers keep well in the fridge and can be reheated the next day. 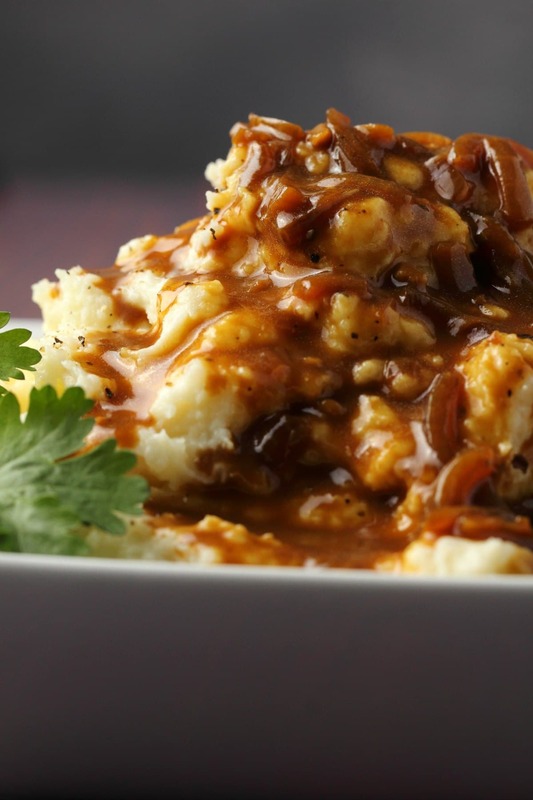 So tell us what you think of this vegan gravy in the comments! Please also rate the recipe, it’s so helpful. Sign up to our email list while you’re here, you’ll get an awesome 10-recipe ebook containing delicious vegan dinner recipes and you’ll be the first to know when new recipes are posted to the blog. 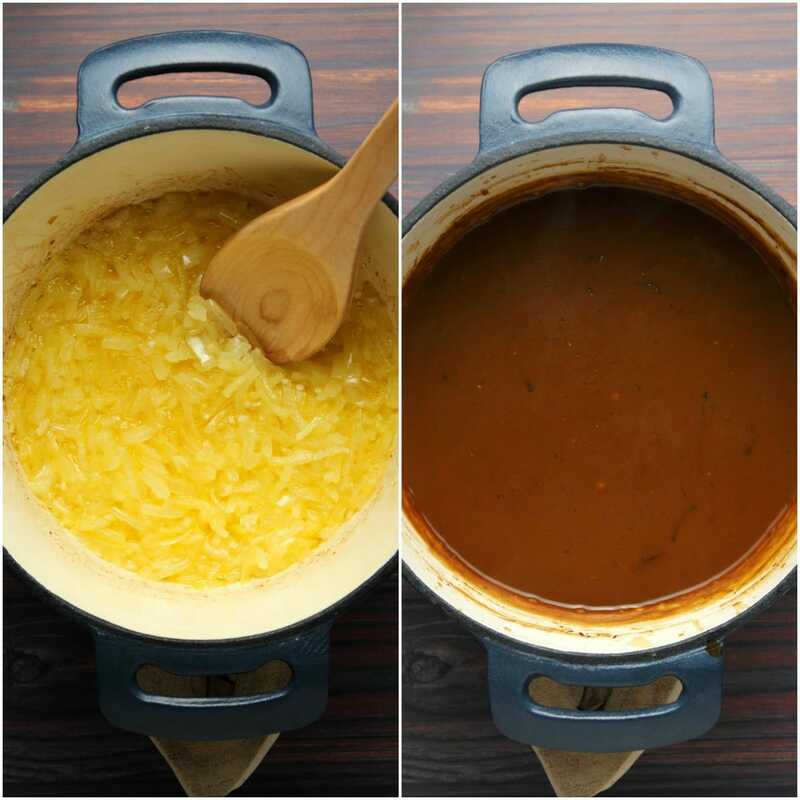 Super rich and beautifully flavorful vegan gravy. 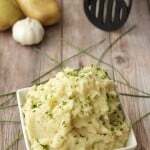 Perfect to pour over your mashed potatoes! Easy to make, hearty and satisfying. Add the vegan butter to a saucepan and let it melt. Then add the chopped onions and garlic and fry in the butter until very soft and translucent. Mix the flour and a little of the coconut milk together and mix it into a paste. Then add the rest of the coconut milk to the paste and whisk it in so that the flour and coconut milk is well combined and free of lumps. Then add the flour and coconut milk mix to the saucepan along with the soy sauce and vegetable stock and whisk together. Bring to the boil, whisking constantly and then let it boil for a few minutes until it thickens. You don’t need it to get very thick, because you want it to be a nice pourable consistency. Add some black pepper and then sea salt to taste. 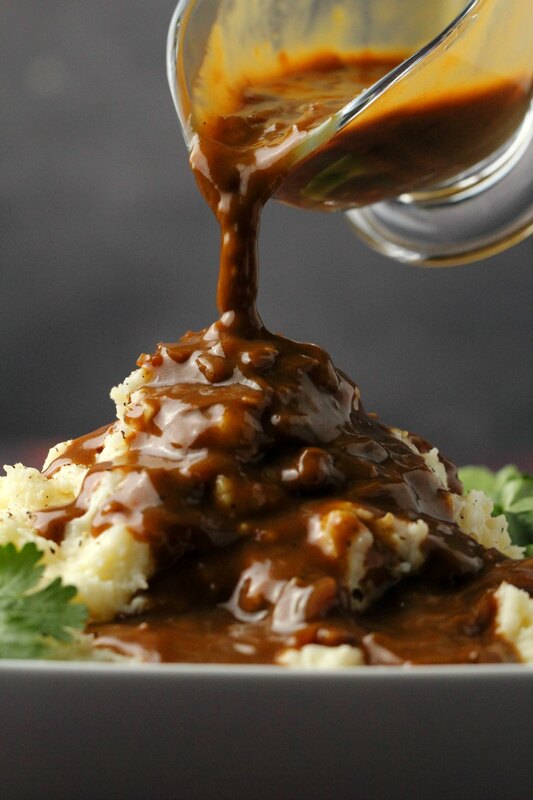 Serve over mashed potatoes or over anything that needs a delicious rich gravy. 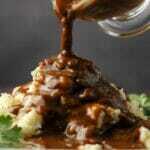 *To make this gravy gluten-free you can try it with a gluten-free all purpose flour and a gluten-free soy sauce. 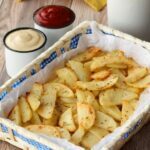 I have not tested it this way but have made other sauces with gluten-free all purpose flour and it has worked perfectly. Hi Tina, it’s salt ‘to taste’ so only add it if you want to or feel it’s needed. If it’s salty enough for you then no need. Does this taste even remotely like coconut? Thoughts on substitutions ..? almond/oat ? I don’t think it does at all, but you could also use a different plant milk, I haven’t tested different ones I’ve only made this with coconut milk but almond or soy should both work fine. Hello is it possible to freeze the gravy? I think so! It might be thicker once it’s been thawed after freezing so you might need to add a bit more liquid when reheating. 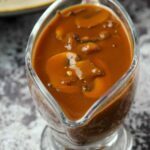 This is the best vegan gravy recipe IMHO and I have tried others before, it has become my “go-to” gravy recipe so much that, for convenience and time-saving, I make extra batches and freeze individually, they keep in my freezer for weeks and it is soooo delicious! Now I just have regular soy sauce (La Choy or my favorite store brand, usually low sodium) so i use that and really don’t need to add extra salt, also the coconut milk really does add to the richness but I am willing to try the soy milk as well, thanks again, Allison, and keep up with the fantastic vegan recipes! Just the rich, hearty and mouthwatering gravy I have wanted! Hi! 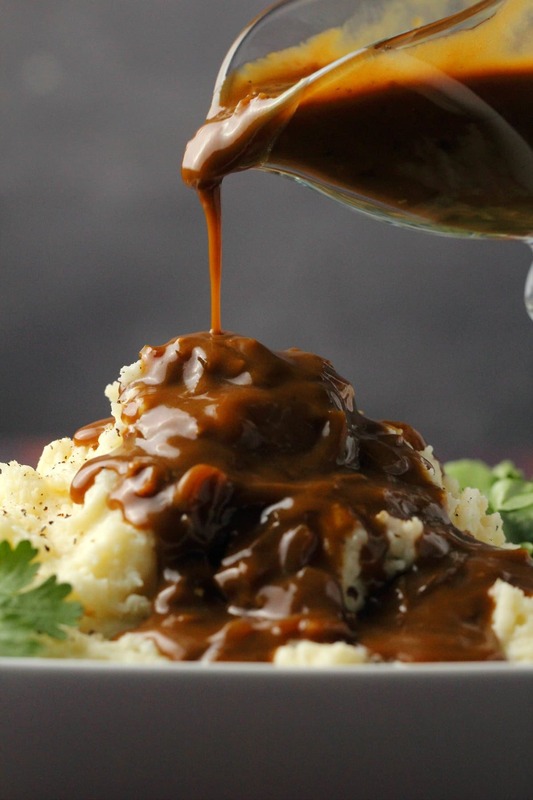 This is a beautiful simple recipe and it makes ey whole lotta gravy! Can I ask you is there any way to keep it that rich dark color. It turned a lot lighter when i added the cocunt milk+flower. I actually added some of it to my roasted mushrooms and it was out of this world good! 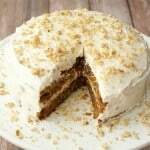 Aaamazing site, amazing recipes!! Thank youu!! I would imagine around 3-4 days ahead would be fine, keep stored in the fridge and then reheat. I loved the taste of this gravy but it didn’t exactly match up the colour of regular gravy, it was more like a creamy colour. What I did was instead of putting two cups of broth, I added some red wine, which gave it a darker colour and stronger taste.